Essaylab is one of the writing services that offer academic assistance in the forms of writing from scratch, editing, formatting and business writing. According to the website’s information, the customer is able to order any type of paper like lab report, book review, dissertation or even powerpoint presentation. Check our review about the Essaylab.org quality, safety and services. The website usage is quite simple. The main page is neat and does not contain any information that would obscure you. To make the order, you have to fill in your personal details and then proceed with the steps that will describe your desired paper. Essaylab offers a number of payment methods, but all of them are processed through PayPal system. The company states that you are in safe when using this website as the encrypted protection is used accessing your personal details. If you are looking for an essay lab promo code it is not too easy to find it on the page. Literary, you would not be able to get it anywhere without contacting support team. The way how Essaylab defines their prices is rather peculiar. For sure, you are paying for the number of pages that you need. Secondly, your academic level is taken into account. It if convenient that all the years of study are separated and have their own price. The third factor that influences the payment has been quite disappointed for us: there are just 5 types of deadlines and they are stated like “7-8 days”, “3-23 hours”. The question is if it is fair to pay the same price for 20 hours deadline as one would pay for his work to be done in 3 hours. In our opinion, such price definition does not make sense and the company should reconsider their pricing policies. 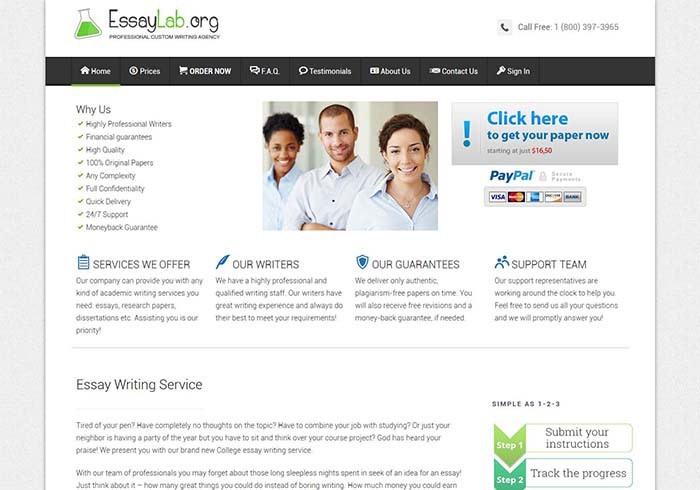 If you compare the prices at Essaylab with other services you will, definitely, be able to find more attractive ones. There are some free features that are offered by the service of Essaylab. They are free title page, outline, revisions, plagiarism report, and email delivery. While first 4 features are really nice to get for free the last one “free email delivery” does not make much sense. Why would one need to pay additionally to get an email with the product ordered? What is more, when you are trying to click on the free features’ buttons they are not working, which is quite suspicious. Refund policy of the company guarantees that there are certain cases when the customer is able to get their payment back. However, before ordering check our Essay lab reviews to know the trick. In most cases the company offers the necessary refund amount at their own discretion, which means that the decision is not always on the side of the customer. You are not assured of getting the exact amounts or percentages back but it is said that the refund can be adjusted. To sum up our review, Essaylab.org is a rather convenient essay writing service, however, there are a number of features that must be fixed or adjusted.